The Navy attempts to right USS Oklahoma on March 19, 1943. National Archives photo. 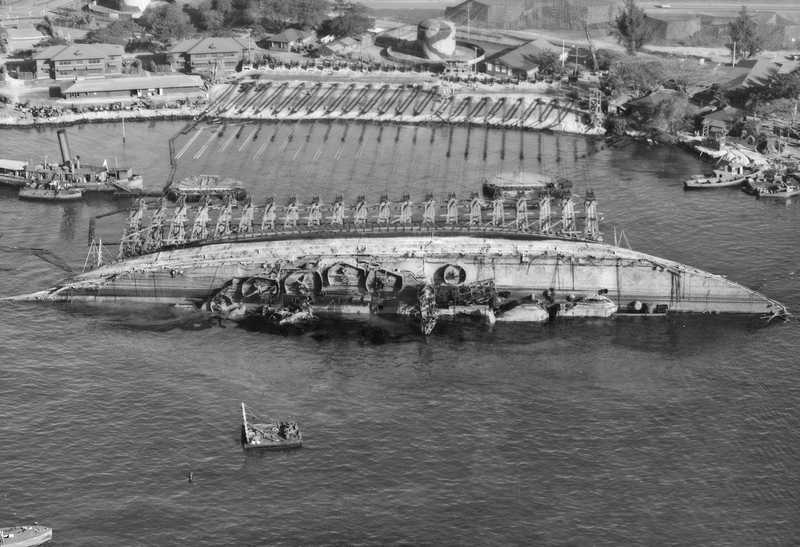 The Pentagon will renew its efforts to identify previously unknown service members buried at military cemeteries, starting with sailors and Marines who died aboard USS Oklahoma (BB-37) in the 1941 attack on Pearl Harbor. Deputy Defense Secretary Bob Work announced this week that the departments of defense and veterans affairs would work to identify the 388 unaccounted-for Oklahoma sailors and Marines buried at the National Memorial Cemetery of the Pacific (NMCP) in Hawaii within five years. This comes after the Navy decided against exhuming the bodies last year, and after years of lobbying by family members and congressmen to have the government identify and return the bodies to their relatives for proper burial. “Recent advances in forensic science and technology, as well as family member assistance in providing genealogical information, have now made it possible to make individual identifications for many Service members long-buried in graves marked ‘unknown,’” read an April 14 memo from Work. Due to those advances, Work wrote that he wants the government to pursue disinterment and identification when evidence suggests a 50-percent chance or better of identifying a single unknown body, or the likelihood of identifying 60 percent or more of bodies when the service members were buried as a group. This new disinterment policy aims to balance the desire to return remains to their families for proper burial with respect and cost concerns. When the Navy last year rejected the call to exhume the bodies, Russell Beland, deputy assistant secretary for military manpower and personnel, wrote in a letter that “the sailors and Marines of USS Oklahoma would be outside the sanctity of the grave for a third time following their heroic sacrifice at Pearl Harbor,” Stars and Stripes reported. Given all the effort that has gone into collecting DNA and medical and dental records from the sailors’ and Marines’ relatives, Work’s memo suggests the case of the Oklahoma crew will more than meet his new criteria. “Since 2003, the Department has contacted families, collected and analyzed DNA from 84 percent of applicable USS Oklahoma family members, and has collected 90 percent of antemortem medical and dental records from the ship’s crew,” according to the memo. The NMCP alone holds the bodies of 2,760 unknown service members from World War II and the Korean War, including the 388 from Oklahoma spread out in 61 caskets in 45 grave sites. Overall, the Joint POW/MIA Accounting Agency reports that there are 83,126 total missing personnel – 73,515 of them from World War II, and 48,103 of those missing from the Pacific Theater. Oklahoma was a battleship commissioned in 1916 and was based in Pearl Harbor. The ship was among the first to be hit by bombs and torpedoes when the Japanese attacked, and within minutes the ship capsized. Oklahoma lost 429 members of its crew. In July 1942, the Navy began its salvage effort. The ship was righted about a year later and decommissioned in 1944. In 1947 the Navy sent two tugs to tow the battleship to a San Francisco scrapyard, but a storm hit while crossing the Pacific and Oklahoma quickly sank. It has never been recovered and its exact location is unknown.